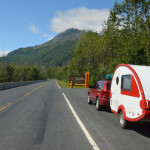 On the way into Seward Alaska take a right turn and check out the Exit Glacier. So named because it was the exit for the first recorded crossing of the Harding Ice Field in 1968. 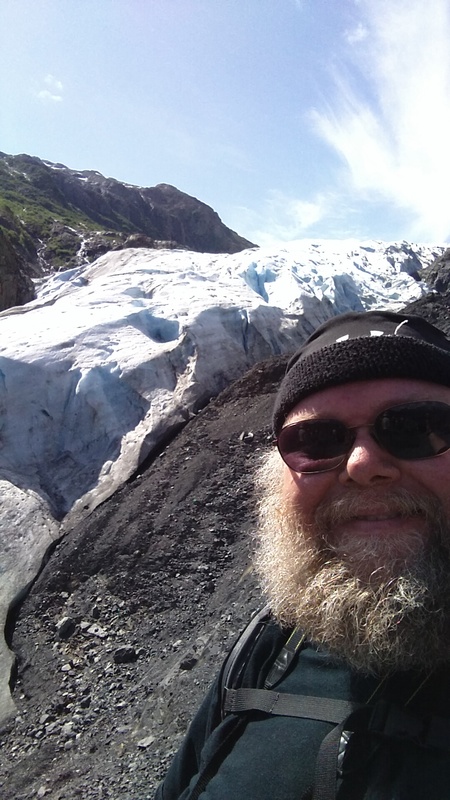 This is the most accessible glacier in the area, and a great day hike through a nice forest and over bedrock that was until recently covered by thick, scouring, glacial ice. A fair sized parking area tends to fill up on nice days. I showed up fairly early and that wasn’t a problem, even on this prime day. Rangers are actively working to keep people parking where they should. A short walk from the parking lot leads to a small ranger station/visitor center and a restroom where you can fill up a water bottle as well. The trail to the glacier leads across the outwash plain through forest and makes a loop. To see the glacier up close requires heading up a little bit. 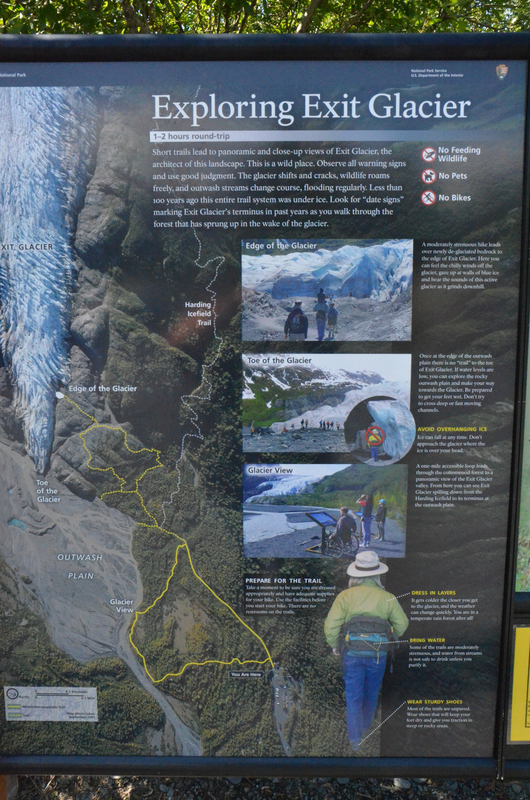 For those who need more of a physical challenge the trail also heads up to the base of the Harding Icefield. Today I did the trail to the lower viewpoint, about 2.6 miles stopping to take photos and soak in the view was just short of two hours. The elevation gain is about 200 feet, most of that in the last third of the hike in. The trail has two loops, one on the flat and one on the hill so you can take almost the whole walk without seeing the same ground again. There were in fact a lot of people hiking, but all moving at different paces. Not so crowded that it was line of people moving up the mountain. Plenty of opportunity to pass or be passed and have the opportunity to chat with a few folks or be on your own. There were a couple of really large family groups here. One in particular I counted as they took a group photo was 25 people. I met a few people who were working pretty hard to get up the trail, and I would drop into my encouraging positive mode. After a little encouragement I often would leave them with a bit of advice I give my scouts and live by myself, “The right speed is the pace where you can still talk”. Seems like a good indicator of how stressed your body is. Now of course if you are in good shape that’s going to be faster, maybe a lot faster. As for me, I’ve always been about a two mile per hour guy. Pretty much since I was about 12. I spent a lot of time looking at the rock textures. I took a few photos and have included a couple below. Very interesting to see rock that has until quite recently been under a moving river of ice. Also interesting to see the ground up rock that has been piled up as the glacier recedes. It is a pleasant trail, with steps where the bedrock is steep. This means that you can pay attention to your surroundings without worrying as much about your footing. That bedrock can be tough when it has a little sand or gravel on it, not to mention when it might be wet. I also took the trail out to the outwash plain and got up close to the river there. The Exit Glacier is a good place to get a feel for glacier recession first hand. 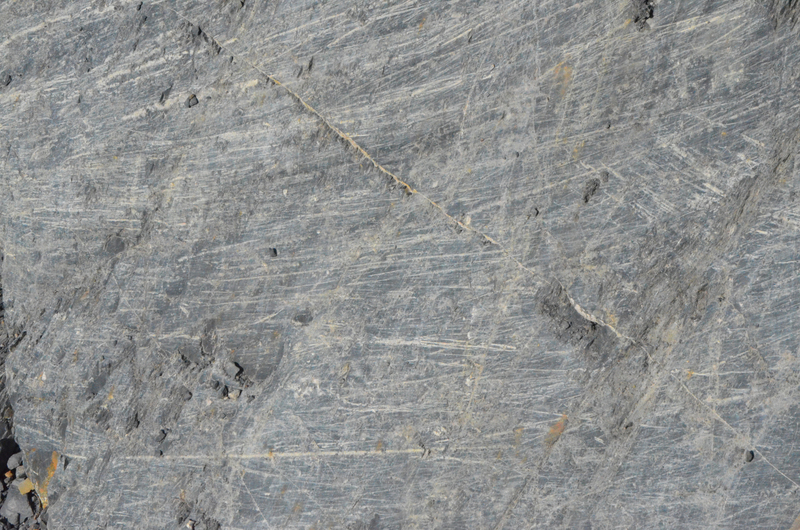 There are signs that mark where the face of the glacier was historically in a given year. A few interpretive signs give an overview as well. In my travels around Alaska I heard a ranger elsewhere mention that all the glaciers in the state being studied are receding, with four prime exceptions. These four are growing longer and deeper year over year. 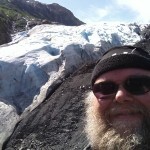 So, Exit Glacier, a nice little day hike to get you out of the car, right on the road to Seward. Most this National Park is remote, without roads. This corner is the exception. Since I was on my way to Seward the trailer was in tow. Long shot of the glacier. 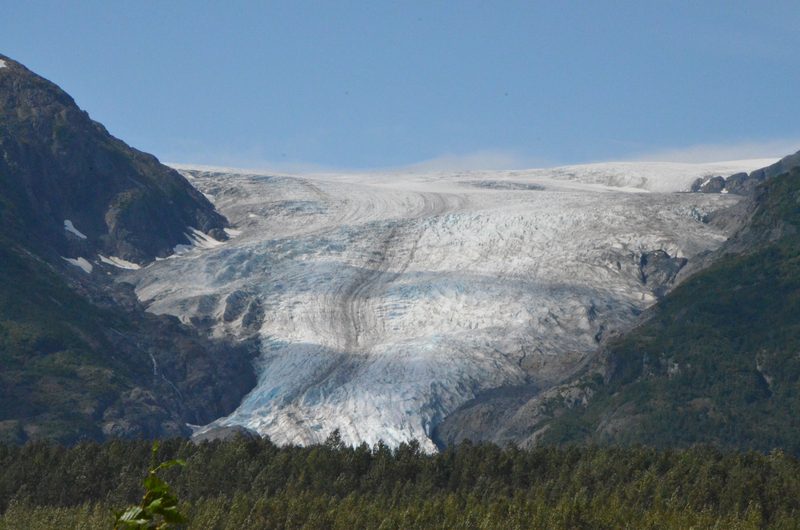 The viewpoint and trails are accurate, but the glacier has receded such that the toe is at the viewpoint now. Part of the paved and level section. A great stroll for all ages and abilities. See the 1917 sign, this is where the glacier’s toe was in that year. These stairs are set on top of the bedrock. The inclined bedrock can be a little tricky when there is a little sand, gravel or water on it, the steps allow you to pay attention to the view rather than your footing. Folks find it tempting to wander off the trail, and sometimes it may be a little less than clear where it is. These guides help keep people’s impact concentrated on the path. This area was covered by ice a few decades ago. This rock would have had ice grinding over it like a boulder in a stream for who knows how long prior to the past couple decades. 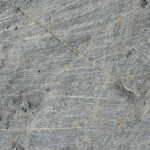 Rock faces have these characteristic scratches from gravel and rock that has been dragged across in the ice. Rock, water, ice, vegetation, sky. The toe of the glacier. In 2007 the glacier would have filled this area and extended a bit onto the plain below. As the ice flows over the contours of the rock it breaks on the surface to form horizontal crevases, when it goes through a dip these will fuse back together. Closer look at at ridge. This view would have been entirely hidden in 1961 by the face of the glacier. Today it is a flat plain with a river in the middle. Keep in mind that all that water isn’t just from this Glacier, it is also melt from up on the ice field. I added the red and white text and lines to help reading this sign that was along the trail. 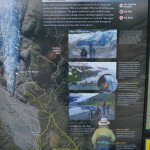 Signs along the trail were placed where the toe of the glacier was in a given year. At 1926 and a couple of other spots along the path there were very nice wooden benches for resting should you wish to just soak in the view. Inside the small visitor’s center/ranger station is a relief map of the Kenai Fjords National Park.